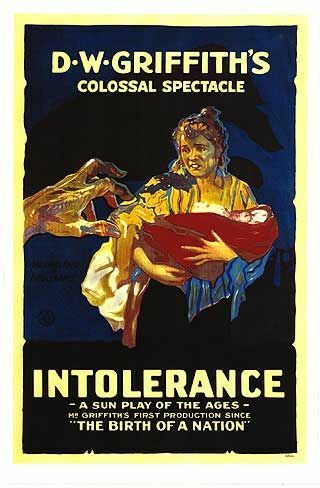 Tag line: "D.W. Griffith's Colossal Spectacle"
D.W. Griffith’s monumental epic, Intolerance, would be quite an undertaking even if it were made today. The fact it was produced in 1916, when motion pictures were still in their infancy, is downright remarkable. Intolerance is broken into four sections, each telling a tale from a different period in history. The majority of the film is dedicated to the modern-day story, about a young girl (Mae Marsh) who marries a boy (Robert Harron) without realizing he works for a criminal they call the Musketeer of the Slums (Walter Long). Things take a troubling turn when the Boy is framed for a crime he didn’t commit, and sent to prison. The second tale, set in Ancient Babylon, concerns a Mountain Girl (Constance Talmedge) who’s fallen in love with Prince Belshezzar (Alfred Paget), the ruler of Babylonia. Worship of the God Ishtar is spreading in Babylonia, much to the dismay of the high priest of the God Bel (Tully Marshall). In an effort to return the country to the “true faith”, the High Priest conspires with King Cyrus of Persia, who plans to invade. The third section involves Catherine de Medici (Josephine Cromwell) and her attempt to have every Hugueonot murdered, including the recently-engaged Brown-Eyed Girl (Margery Wilson). All three of these segments are then tied in with the story of Christ (Howard Gaye) and his eventual crucifixion. Intolerance is a gargantuan film, what with its huge set pieces and thousands of extras, but what made it revolutionary was the manner in which Griffith designed it, splicing together four distinct stories and guiding us from one tale to the next, then back again, until all had reached their conclusion. In an era when people were still unaccustomed to seeing pictures move on a screen, this experiment, challenging audiences to follow four separate narratives at the same time, was certainly a bold one. This, combined with the techniques Griffith had spent his career perfecting (extreme close-ups, sweeping camera movements, etc), resulted in a motion picture for the ages. After directing hundreds of short films for Biograph, D.W. Griffith had, by 1916, firmly established himself as a master of his craft. With Intolerance, he showed the world he was also one of the cinema’s first true artists.